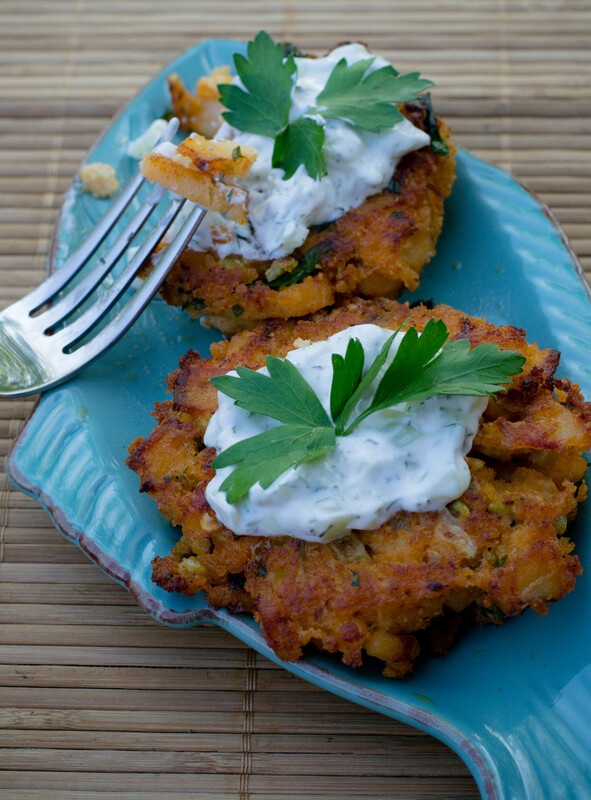 Crispy Cod Cakes - What the Forks for Dinner? What to do with cod filets? Crispy Cod Cakes of course! Cod’s mild flavor makes it a most versatile fish…. fish tacos, fish and chips, seafood stews, and soups. 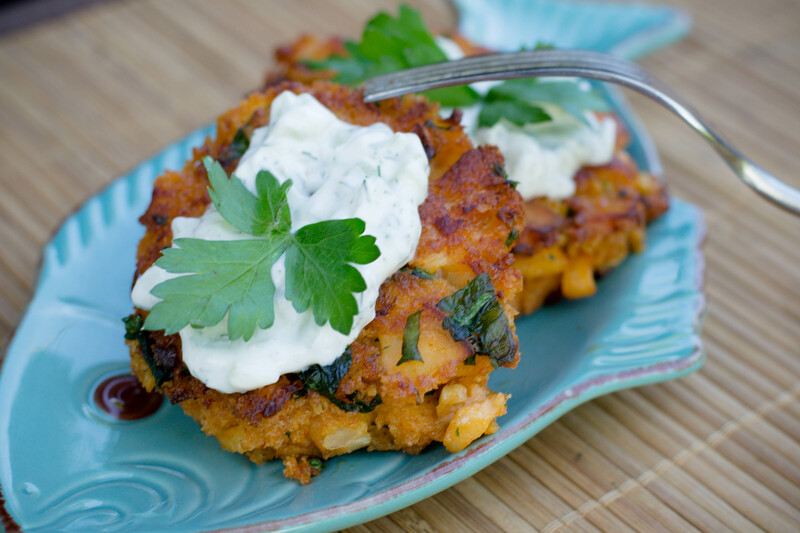 And of course cod cakes. This recipes came from a pondering of what the “forks” for dinner. I really had planned on just pan frying the cod. I made this on a particularly warm day and did not want to fire up the oven. 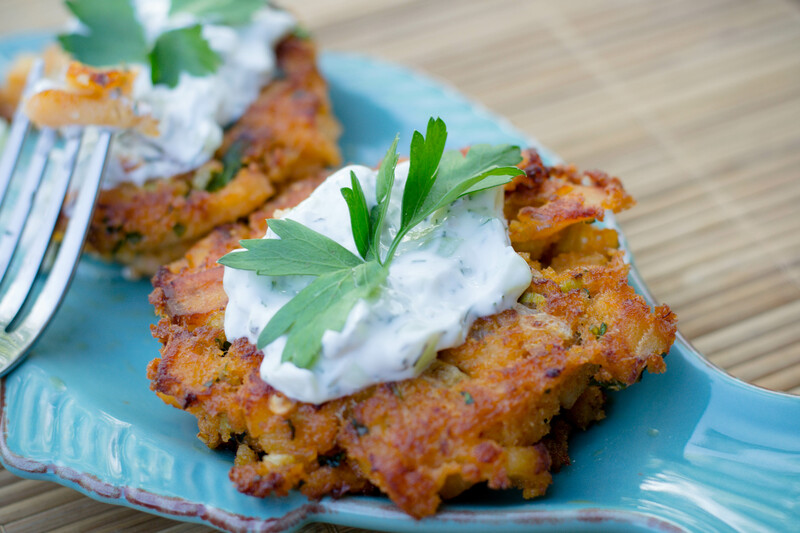 I have a recipe for salmon patties….a.k.a. 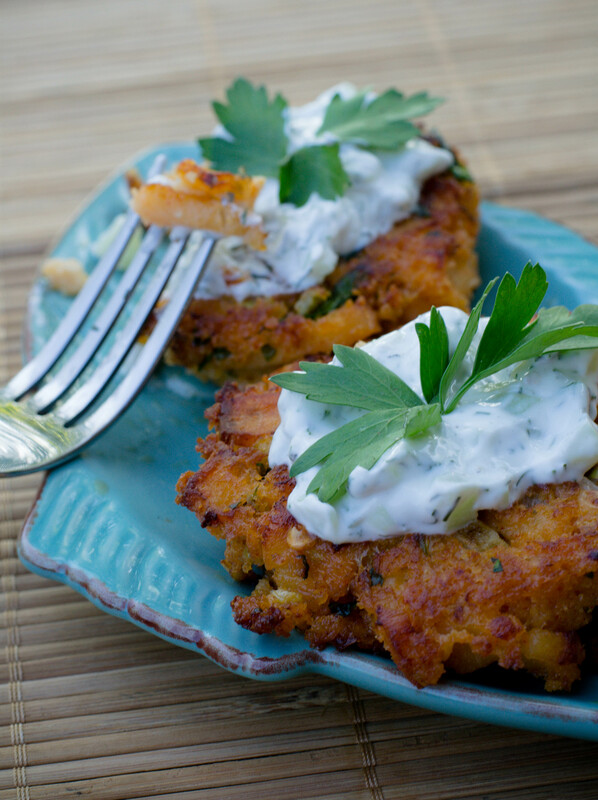 salmon cakes and thought why not with cod? Turns out this was a stellar decision. 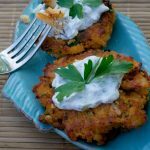 I used some of the same ingredients and the result was crispy, crunchy on the outside, and moist and flavorful on the inside. Topped with a cool cucumber sauce, it was a great warm weather alternative to baking. I as I do with salmon puppets start with fresh, uncooked fish. I know the traditional recipes call for canned or precooked fish, but I like to step out side the box. Besides I think using as fresh as you can get is always best. Using fresh fish makes the final product moisture on the inside while keeping it crispy on the outside. Since the cod cakes cook pretty quickly, I sautéed the onion and celery first, biting into raw onion and celery would have taken away from the taste. Eggs, Miracle Whip, (mayo if you must), a touch of dijon, (dijon adds a little some to fish), and a pinch of red pepper flakes. Red pepper flakes are a big hit in our house and they will add a touch of spice to the dish. Make sure when forming the patties to not over work them. I use a measuring cup as a “mold” it makes a perfect patty/cake, uniform in size and not too much handling. Refrigerating the molded cakes is the most important part of this recipe. It allows the cakes to set up and hold their shape. Panko crumbs are the best. They result in a crispy crunch that is beyond compare. When cooking, resist the urge to press down on the cakes, as they cook. Pressing will destroy the shape. Use a neutral oil when cooking the cakes, something like canola, you want all the flavors of the cake to come through. These cakes could be served on a bun as a fish sandwich, but I really enjoyed them as is. Well, except for my go to fish sauce. 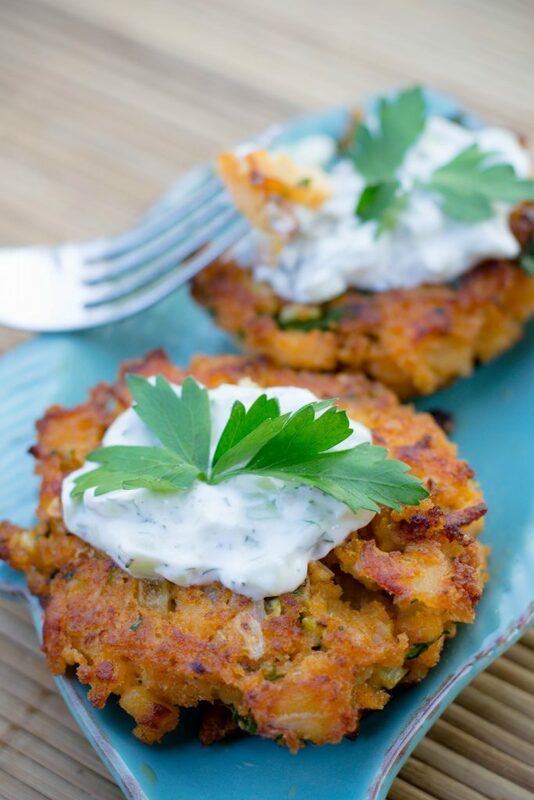 Cucumber Sauce is a fish topping I have made for years and used on all types of fish. It did not disappoint on the cod cakes. Diced cucumber, a little Miracle Whip, a dab of sour cream or yogurt, and dill. 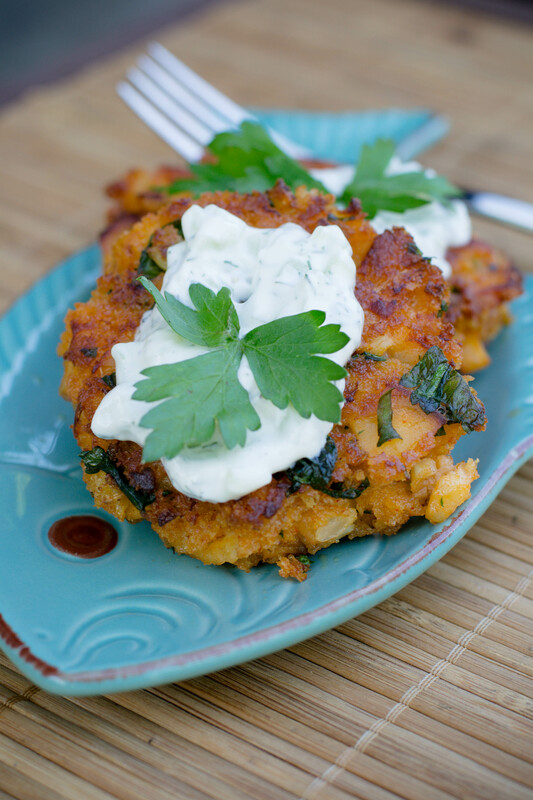 Make and let the flavors blend for about 30 minutes and serve on the beautiful Crispy Cod Cakes. 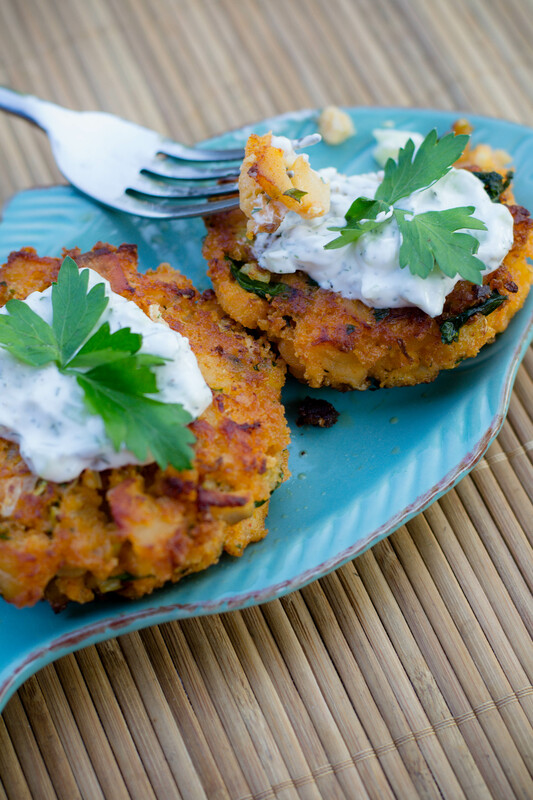 Next time you are wondering what the “fork” to do with fish, try Crispy Cod Cakes! Place minced cod in a large bowl. In a sauté pan melt butter, add the celery, onions and garlic, and sauté, until the vegetables soften and the onions are translucent,set aside. In a small bowl, mix together the mayonnaise, dijon, eggs, salt, pepper,paprika and red-pepper flakes, add this mixture to the bowl with the sautéed vegetables. Add to cod in the large bowl. Gently mix in panko crumbs. and parsley to cod mixture. Form the mixture into 4-6 patties, depending on the size cake you prefer. I have found using a 1/3 cup measuring cup works well for a mold. You can also make them small for appetizers. Place formed patties on a baking sheet and transfer them to the refrigerator for at least 30 minutes to set. In a large skillet over medium high heat, and add the oil. When the oil is hot, carefully sauté the patties until they are golden brown, approximately 4 to 5 minutes a side. Serve with cucumber sauce. Mix all ingredients and allow to set for 30 minutes.